Delta-ee was in Dusseldorf last week for the Energy Storage Europe (ESE) 2019 expo and conference, a fantastic opportunity to talk through the latest European storage trends with key players in the market. 2018 was a very positive year for storage: in our recent report, published in collaboration with the European Association for the Storage of Energy (EASE), we found that the annual European market grew 75% in 2018 to reach a total market value of over €1 billion. The positivity across all three market segments – residential, C&I and grid-scale – was reflected in many of the discussions we had at the fair. One stand-out trend at ESE this year was the potential of E-mobility to drive growth in energy storage. 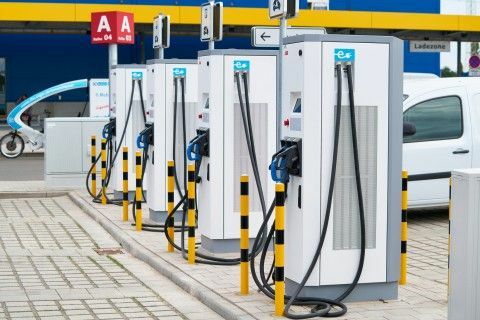 EVs could make up 15% of European passenger car sales by the mid-2020s, and the EU’s Energy Performance in Buildings Directive will further incentivise the rollout of EV chargers behind existing grid connections. Stationary energy storage will play a crucial role in supporting the high power and energy demands that chargers place on local distribution networks. Network upgrades are, and will remain, expensive, but the cost of storage continues to fall. With three conference sessions at ESE 2019 dedicated to E-mobility and a wide range of stationary storage vendors targeting EV charging, the industry is responding to this opportunity. Ads-tec and Enercon both had EV chargers on show at the expo, and we spoke with many exhibitors that are positioning their products to support EV charging. Which raises the question: will E-mobility eventually become a distinct segment within the stationary storage market? Our thinking is that it will: Delta-ee estimates that storage co-located with EV infrastructure is expected to account for around 10% of the European stationary energy storage market within the next three years. The power and energy characteristics of E-mobility storage systems may be quite different from other applications, perhaps opening the way for new types of hybrid system. E-mobility is certainly going to be an exciting part of the market over the coming years. We will be monitoring developments closely in our research and expect that it will still be a major topic of discussion at ESE in 2020. Tuesday, 26 March 2019 Energy Storage Europe 2019: will E-mobility become the fourth segment for storage?